If you're an athlete trying to gain muscle mass, you'll need to consume more calories than you burn. However, simply eating more won't give you the results you want unless your meals provide a balanced proportion of carbohydrates, protein and fats. A 5,000-calorie mass-gaining diet should consist of approximately 60 to 65 percent carbohydrates, 20 to 25 percent fat and 15 to 20 percent protein. Ask your doctor or a sports nutritionist for help designing a healthy meal plan. To avoid feeling overfull, you should spread your 5,000 calories out over the course of the day, starting with a breakfast that supplies around 1,000 calories. 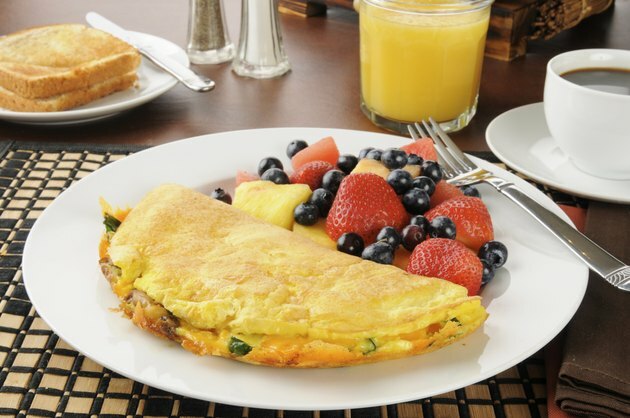 A typical breakfast might be three large scrambled eggs, two slices of toast spread with trans fat-free margarine and jelly and a cup of 100 percent fruit juice. Use egg whites or egg substitute for less fat and cholesterol and choose whole-grain products like whole-wheat bread for more fiber, vitamins and minerals. Lunch on a 5,000-calorie diet might consist of a 1/4-pound lean ground beef patty, lettuce and tomatoes on a whole-wheat hamburger bun paired with 16 ounces of low-fat milk and a salad containing fresh vegetables, dried fruit, sunflower seeds and reduced-fat dressing. This meal would provide approximately 815 calories. Avoid obtaining your protein from fatty cuts of beef or pork and processed or fried meats. Instead, pick skinless poultry, fish, shellfish, tofu, beans and legumes prepared with a minimum amount of added fat. An athlete aiming to consume 5,000 calories per day could have 6 ounces of grilled or roasted chicken breast, 2 cups of whole-wheat pasta topped with 1 cup of tomato sauce, 1 cup of steamed green beans and 1 cup of low-fat milk followed by a dessert of reduced-fat ice cream and chocolate syrup at dinner for a meal supplying about 1,400 calories. Fruits and vegetables like tomatoes and green beans provide athletes with calories and essential nutrients with virtually no fat. Eat a variety of colorful produce each day. Frozen and canned fruits and vegetables are a good option as long as they are unsweetened or prepared with little or no sodium. If your previous diet did not contain lots of produce, increase your intake gradually to allow your digestive system to adjust to your higher fiber consumption. Aim to eat every three to four hours on a 5,000-calorie diet. Midmorning, afternoon and evening snacks interspersed between your larger meals can help you do this. A 610-calorie morning snack could be 2 ounces of nuts, 1/2 cup of dried, unsweetened fruit and one piece of whole fresh fruit, while your afternoon snack might be a whole-wheat bagel, tuna fish mixed with reduced-fat mayonnaise, low-fat cheese and 1 cup of unsweetened applesauce for 815 calories. A post-workout snack could be 2 cups of chocolate milk for about 355 calories. Pick unsalted, dry-roasted nuts and low- or nonfat dairy products for the least amount of added fat and sodium. Aim to drink at least 1 cup of fluid per hour throughout the day, with 2 to 3 cups of liquid like a sports drink just before or after exercise and 1 to 2 cups for every half-hour while you're exercising. Drink an additional 2 cups of liquid for every pound of weight lost when your daily exercise is complete. Drinking plenty of fluid will prevent dehydration and help you avoid gastrointestinal problems from a high intake of fiber-rich grains, fruits and vegetables.